After beginning her career at English Heritage, the entertainment executive went on to manage events venues Alexandra Palace and the O2 during the London Olympics. Now managing director of Really Useful Theatres, she tells Nick Smurthwaite about embarking on a mission to revitalise the company’s grand theatre buildings. The first big London show Rebecca Kane Burton ever saw was Joseph and the Amazing Technicolor Dreamcoat with Jason Donovan at the London Palladium in 1991. She loved it so much she saved up her pocket money to see it again – not once, but twice. 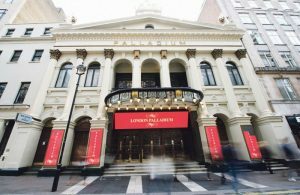 Twenty-six years later, she is in charge of the London Palladium, working for Joseph’s co-creator, Andrew Lloyd Webber. 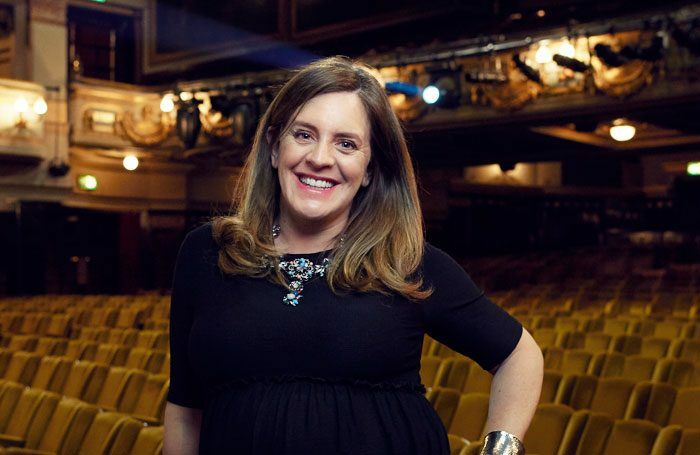 As managing director of Really Useful Theatres, it is Kane Burton’s job to look after the seven theatres owned in whole or in part by the group: the Palladium, Theatre Royal Drury Lane, Adelphi, Cambridge, Her Majesty’s, New London and the Other Palace – formerly the St James Theatre. In addition to maintaining and developing the buildings, she will oversee programming and ticketing, and generate sponsorship deals, reporting to Mark Wordsworth, executive chairman across the two Really Useful companies. 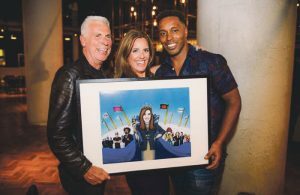 She came to the job in September 2016 not from a theatre background, but as general manager of the O2 and, before that, managing director of Alexandra Palace. “She walked away from the O2 at its peak because she wanted another challenge,” says music agent and friend John Giddings. 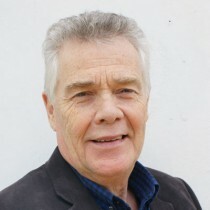 Kane Burton remained with English Heritage on and off for 10 years, finishing up as director of the London region, one of the organisation’s key jobs. One of the things that attracted her to the job was that she knew it had a gem of a theatre in the East Wing that had fallen into disrepair. The whole East Wing, including the theatre, is currently undergoing a £27 million restoration and is expected to reopen next spring. Kane Burton made a career move after researchers from the O2 came to Ally Pally to check out her music programming. They returned to North Greenwich with plenty of ideas and a new general manager. “It was a massive job and I was completely gobsmacked to get it,” she says. “From day one, my to-do list included delivering the Olympic Games [events], masterminding a new ticketing system and launching a roof-walk attraction, as well as the day-to-day running of what is effectively a mini city. Giddings, whose Solo Agency represents some of the world’s biggest music acts, saw Kane Burton in action at close hand on many occasions. “I found her brilliant to work with because she’d bend over backwards to help you,” he says. “Being in the music business, you get stupid requests from artists all the time, but Rebecca never said, ‘Go away.’ She would always go the extra mile to try to make it happen. One of the things she learned from the O2 experience that she has brought to the Really Useful job is that it pays to look outside your own sector and learn from what other people are doing – Kane Burton cites airlines and retail as examples. She feels it was that ability to think outside the box, along with her understanding of what it takes to run a grade-I listed building such Theatre Royal Drury Lane, and her experience of programming from Ally Pally and the O2, that made her a good fit for the job. How do the two companies – Really Useful Theatres and the Really Useful Group – work together? Staging picnic concerts at Kenwood House in London. This one, working for Really Useful Theatres. Who or what was your greatest influence? Richard Branson got me thinking about what it takes to create something from nothing. What do you wish you’d been told when you started out? Somebody gave me a very good piece of advice just before I started my job at English Heritage that has stayed with me: “Just remember everyone pretends they know what they’re talking about.” The other thing to remember is that there is no obvious career path – follow your instincts. If you hadn’t been an entertainment executive, what would you have done? Definitely a journalist or writer of some kind. I love writing. My former PA gave me a lovely silver bracelet, which I always wear to a board meeting or a presentation. London’s Roundhouse, who will be head of programming at the Palladium. In terms of musical bookings, Kane Burton and Gaydon are looking at younger, up-and-coming artists as well as the big, arena-filling stars. One of Kane Burton’s biggest challenges will be Haworth Tompkins’ £35 million refurbishment of Theatre Royal Drury Lane, the other jewel in Really Useful’s crown. The company will submit planning permission for “substantial work” to Westminster Council this September, with the expectation of work starting another 12 to 18 months after that, assuming Westminster approves the proposals. RUT is in the process of buying the building next door to the Theatre Royal, which will become the new headquarters for the Really Useful Group, currently based in Slingsby Place, also in the West End. When the time comes, the theatre will have to close for an extended period of time. But what is the company proposing to do to this most iconic of London venues? “I can’t talk about the details but there is an opportunity here to open it up more,” Kane Burton says. “While these old theatre buildings are undoubtedly grand and imposing, that can sometimes make it difficult for people to want to cross the threshold. The job of their present-day custodians is to make them as accessible as possible. There are lots of different ways of doing that, such as the terrace we’ve made at the Theatre Royal, overlooking Catherine Street, where you can sit outside on a nice evening and have a glass of champagne without even seeing the show. Of course, the recent terror attacks in London and Manchester have not helped make audiences feel comfortable or safe. Kane Burton and her colleagues have made security in the Really Useful venues a top priority, bringing in extra security personnel and urging staff to be super-vigilant. “We’ve also met up with other West End theatre groups and shared intelligence,” she says. A dedicated theatregoer – “I love that sense of anticipation before the show starts” – Kane Burton anticipates that she will be seeing a lot more child-friendly shows in future as she is about to become a mother for the first time. Presumably she will also be taking maternity leave? Does she believe the old Noel Coward adage about work being more fun than fun?